As the weather gets nicer, the people of Huron County start spending more time outdoors and enjoying the unique characteristics of our area. Another reason to get out and explore this May is Museum Month! The International Council of Museums started International Museum Day in 1977. The excitement grows each year, and in 2012, about 32,000 museums in 129 countries participated. The theme for 2014 is, “Museums Make Connections.” In Ontario, one day isn’t enough, so the Ontario Museum’s Association has decided to make May the month for celebrating museums. The St. Joseph Museum and Archives is open by appointment through the Hessenland Country Inn. The St. Joseph Museum and Archives is maintained and operated by volunteer members of the St. Joseph Historical Society, who are members of the Ontario Historical Society. They are located at 72981 Bluewater Highway, R.R.2 Zurich. Huron County Libraries are partnering with the Huron County Museum to celebrate Museum Month with the popular Museum on the Go program. Three interesting themes will be explored – Mystery Artifacts, Toys and Games and Huron on the Homefront. The program will be at the Blyth (1-2 p.m.) and Wingham (10:30-11:30 a.m.) on May 10, Kirkton (May 15, 6:30-7:30 p.m.), Goderich (May 24, 2-3p.m. ), Clinton (May 20 and 27, 6:30-7:30 p.m.), Exeter (May 29, 6:30-7:30 p.m.) and Bayfield (May 31, 12:30-1:30 p.m.). The Huron Historic Gaol has opened for the season, and along with the Huron County Museum will be celebrating Museum Day on May 18 from 1-4:30 p.m. by offering visitors admission by donation. Learn about past prisoners at the Historic Gaol, celebrate trail #6275 at the Museum and enter draws for family memberships. 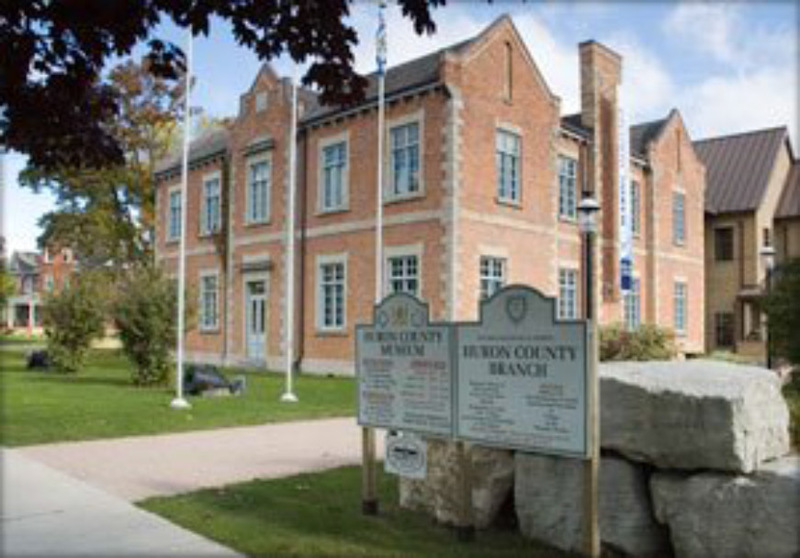 The Huron County Museum is located at 110 North Street, Goderich, and is open Tuesday through Saturday from 10 a.m. – 4:30 p.m., with extended hours on Thursday evenings, and on Sunday from 1-4:30 p.m. The Historic Gaol is a National Historic Site and located at 181 Victoria Street North, Goderich, and is open Monday through Saturday from 10 a.m. – 4:30 p.m., and from 1-4:30 p.m. on Sunday. The School on Wheels Railcar Museum allows visitors to climb inside an artifact that will be 100 years old this July. From 1926 to 1965, Clinton native Fred Sloman and his family educated students in remote areas of northern Ontario in this railcar. This site is open Thursdays through Sundays and holidays, starting Victoria Day weekend until the last weekend in September from 11:00 a.m. – 4 p.m. The School on Wheels Railcar Museum is located at Sloman Memorial Park, the perfect place for a post-visit picnic (76 Victoria Terrace in Clinton). Van Egmond House is one of the oldest homes in Huron County. Visitors can explore each floor of the charming house. Each room is filled with period furniture, artifacts and history. The Van Egmond Foundation hosts many wonderful meals and festivals throughout the summer. The site is open from 10 a.m. – 4 p.m., Thursday through Monday, from July 14- August 15 and by appointment. Admission is by donation. Van Egmond House is located at 80 Kippen Road, Egmondville. The North Huron Museum features exhibits that tell the story of Nobel Prize winning author, Alice Munro, local military involvement in WWI and WWII, CKNX, development of local business and the Wingham police force. The Barn Dance Entertainment Museum is also located within the North Huron Museum. The North Huron Museum and Barn Dance Entertainment Museum are located at 273 Josephine Street, Wingham. The Barn Dance Museum is open May through August, Monday through Friday from 9 a.m. – 5 p.m., and Saturday from 10 a.m. – 3 p.m. Hours for the North Huron Museum are expected to be Monday 1-4 p.m., Tuesday through Friday from 9 a.m.- 4:30 p.m., and Saturday from 10 a.m. – 1 p.m.